I'm a bit late to the bandwagon on this title. 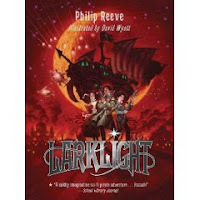 Larklight's gotten rave reviews all over the place, it was nominated for a 2006 Cybil, and now it's being turned into a movie. But better late than never, eh? It's set in space... kinda. In the world of Larklight, Sir Isaac Newton discovered the secrets to space travel and Britain has colonized many of Earth's surrounding planets and moons. Arthur and Myrtle Mumby live with their father in a ramshackle, space-traveling house called Larklight. Mother has died and Arthur is concerned about his father who's withdrawn into his study and only seems to care about collecting specimens for the Royal Xenological Society. And then the spiders show up. These aren't just any spiders. They are huge white spiders that travel in a spiny black ship and seem intent on capturing the Mumbys and spinning Larklight into a cocoon. Arthur doesn't know why they've come, he just knows they've got to get out of there, so he grabs Myrtle and they take off in the escape hatch. They end up on the moon where they meet Jack Havock and his roving band of pirates, a mish-mash collection of space creatures from all over the galaxy. And their adventures only get wilder from there. 2. It's set in an intricately developed alternate Victorian world where there is most definitely life on other planets and creatures travel through the aether to reach said other planets. 3. It has great, great illustrations. 4. There is a sequel out now - Starcross: A Stirring Adventure of Spies, Time Travel, and Curious Hats. And there is a third book due out in the fall - Mothstorm. Larklight reminded me of a cross between Alice in Wonderland and the TV show Firefly. If you like fantasy with wonderfully crafted worlds (a la His Dark Materials), you should pick up this book. If you like your fantasy funny and with lots of adventure (a la Peter and the Starcatchers), you should pick up this book. I don't think you'll regret it.